Use it on your layout as a terminal storeroom, a freight depot and office warehouse, a small railroad station, a trucking company office/dock, etc. The super detailed loading dock is especially exciting. 4.5″ Long x 2.25″ Wide x 1.5″ High. Kit features a detailed bay window unit, diamond style shingles, white metal chimney, and our usual laser-cut high quality Peel & Stick windows and doors. For those modelers familiar with our HO scale ATSF depot kit of this design, our N scale version is to the same high level of detail. The finished structure measures 5″L x 1.75″W x 1.5″H. 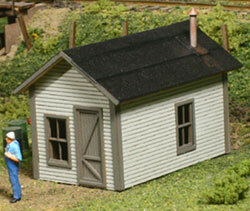 A One Bay Engine House …Warehouse…or Freighthouse …..Trackside, or in your Local Town. Based on an Illinois Terminal Design, this kit Features Board & Batten Siding, Rolled Roofing, Extra-Long AMB Cast White Metal Chimney….All 100% Laser-Cut! A simple and Fun Structure to build with a Dozen Different Uses! 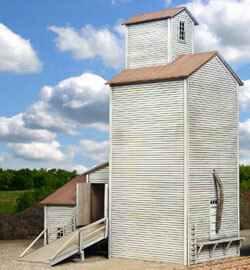 Our N-scale elevator is designed after the many elevators constructed in the early 1900’s and still found standing throughout the midwest. All parts are laser-cut from basswood and thin veneer plywood. The roof is laser-cut from corrugated basswood. 3.75″ long x 2.25″ wide x 5″ high. Trackside or in your “layout town”, this wonderful two story building has space for railroad employee rooming, offices, even a beanery. And it’s narrow enough to fit between the tracks!!! 100% Laser-Cut, features include clapboard siding with pre-cut window & door openings, tabbed and slotted walls and roof parts, layered Peel & Stick windows and doors, a uniquely engineered balcony and outside staircase, plus two AMB cast metal “brick” chimneys and six smokejacks (one for each room.) This kit is quick and fun to build and a great addition to any layout. This cost saving combo package includes four of our best selling N scale kits: the Country Barn, the Two-Story Farmhouse, and two (2) Sonny’s Shacks. Displayed together, they form a typical midwestern family farm scene. All three kit designs feature 100% laser-cut parts and our proven Peel & Stick and Tab & Slot technology for ease of construction. Assembled, the Country Barn measures 4.25″ long x 3.25″ wide x 3.25″ high and includes hexagonal shingles, the Two-Story Farmhouse, with its attached rear kitchen and delicately detailed front porch, measures 2.5″ long x 2.5″ wide x 2.25″ high, and the Sonny’s Shacks, outfitted with green colored tarpaper, each measure 2.5″ long x 1.5″ wide x 1″ high. A wonderful factory for your N scale layout. 100% laser-cut wood with pre-cut window and door openings, layered, peel & stick window and door assembly, covered loading dock, outside staircase, and a roof with laser-cut water tank, skylights, access hatch with door, and cast white metal smokejacks and chimneys. 6.5” Wide x 3.5” Deep x 3.15” High. Footprint 4.125″ long x 1.5″ wide x 8.5″ high. The Illinois Central built a series of new, smaller depots during the post WWII era as a cost savings measure. Many of the company’s older deports were in need of extensive repairs and the decline of passenger service on several lines made it more economical to tear down the original structure and then build a replacement out of new and salvaged lumber. The type “A”, represented by our newest N scale kit, was one of the largest of the four standard designs measuring 36’-3” in length and 16’-3” wide at the end walls. It had a separate waiting room for passengers, an office for the agent, and an express-baggage-freight area. Kit #618 features custom laser-scribed and cut plywood walls and roof, white metal chimney, and a screen door on the passenger waiting room as well as Peel & Stick windows (with individual sashes), doors, trim, and 3-Tab shingles. The kit may be built with either the passenger waiting room on the left or right hand side. The assembled IC depot measures 3” long x 1.5” wide x 1.25” high. Kit No. 620 is our interpretation of the classic Stave Silo, variations of which are still seen doted across the breadbasket of America. Our easy to construct silo is based on a typical 50 foot high x 20 foot diameter vertical structure. 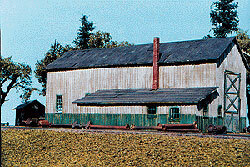 The Stave silo was constructed using wood or concrete planks that were then tightly banded together to form a ring. To increase the strength toward the bottom of a silo, bands were installed at greater frequency. The typical use of this type of silo is not for the storage of harvested grain, but for the creation of feed called silage. Silage is made from grass crops, including corn or other cereals, using the entire green plant (not just the grain). The plant is then shredded and blown into the silo through the fill tube on the side. Once loaded, the top is covered in plastic and is allowed to ferment. The farmer would then unload the silage through the large unloading chute on the side and feed it to cud-chewing animals like cattle and sheep during the winter. The unloading chute typically discharged into a small house at the bottom, as on our kit, or directly into the barn. The Farm Silo with Shed kit features 100% laser-cut wood components for a perfect fit plus Tabbed & Slotted construction with Peel & Stick windows, doors, trim, and roofing material for ease of assembly. Detail parts include cast resin dome and one-piece silo body with unloading chute as well as plastic filler tube and laser-cut wooden access ladder. The Silo may be finished as either a wood or concrete structure. When assembled, the Silo with Shed measure 2.5 inches long x 1.5 inches wide x 4.5 inches high and compliments our very popular No. 614 Midwest Farm Combo and No. 619 Country Barn kits. At one time this elevator was served by the St. Louis and Hannibal Railroad. Of an older design, at some time in its’ history it was covered with corrugated metal to protect it from fire. We have cut ours from Evergreen styrene. Once they were everywhere – serving the needs of small town or city neighborhoods.. Some still remain today, but most are just memories! Our store is based on one still standing today – it last served as a lawn mower repair shop. Features include 100% Laser-cut siding and roof pieces with pre-cut window and door openings, Peel & stick, layered window assembly, and Peel & Stick rolled roofing strips. The perfect little market for you N-Scale layout. Footprint 2.25″ Long x 1.5″ Wide x 1.5″ High. Kit No. 625 features everything the discriminating craftsman has come to expect from a LASERKIT® including Peel & Stick windows, door, trim, and roofing material, custom scribed platform decking, Tab & Slot wall and platform substructure assembly, laser-cut ladders and wheelbarrows, cast resin casks and scale, optional open vats with simulated brine, well-illustrated instructions, and full color signage that includes a unique dill pickle shaped rooftop billboard. As shown, the G. R. Dill & Sons Salting Station measures 9″ Long x 2″ Wide x 1.5″ High. This nifty little cafe with a “live-over” and covered rear lean-to is the perfect companion for Springfield Depot, Ellington Mercantile, or any of our other “town” structures. Features include clapboard siding with tab and slot construction, a covered front porch, and Peel & Stick , layered window assembly. Could also serve as a barber/beauty shop, pub, or tavern. 1.25” Wide x 2.5” Deep x 1.75” High. Designed from a photograph of an old hotel in Nebraska, this style of structure was extremely common in the early to mid 1900’s across the country and up into Canada. Features include 100% Laser-cut parts, with tabbed and notched side and roof pieces for ease of construction. Windows and Doors feature our unique, layered Peel & Stick design, and the covered front balcony has beautiful and delicate laser-cut trim. Another great town building for your layout. 2” wide x 4” deep x 2.5” high. Designed from an old St. Louis tavern located exactly nine miles from the St. Louis City/County line, this building is still standing, although there have been some changes over the years. It is now called The Train Wreck Saloon, features a rear beer garden, complete with an old wood caboose, and is a popular “hot spot”. Our kit is 100% laser-cut wood with layered, peel & stick window and door assembly, “tin” style roof, corner doors and windows, and two AMB cast white metal chimneys. Included with the kit is full color signage and front sign board. 2.25” Wide x 2.75” Deep x 2.5” High. Designed from a photo of an old fire house in Hillview, Illinois, but appropriate for anywhere in the country. Our two story fire house is just large enough to house the town pumper truck on the lower level , with an office and storage above. This kit features unusual Queen Anne style windows which assembly in layers with peel & stick backing, double doors which can be modeled opened or closed, an outside stairway, and hexagonal, peel & stick shingle strips. 1.5” wide x 2” deep x 2.5” high. Designed from plans for a Class A Depot built between 1889 and 1900, this kit can also be built to represent Class B or C depots with a bit of modification. 100% Laser-cut wood with clapboard and scribed siding and pre-cut door and window openings. Windows feature layered construction with peel & stick backing and a precise fit. Roofing is peel & stick tabbed shingle strips and two AMB cast white metal chimneys are included. 5.75” wide x 2” deep (including bay) x 1.75” high. A beautiful kit for any Southern Pacific modeler, available now in both HO and N-Scales. Plans for an O-scale release are also underway. Features include incredible engineering for simplicity and ease of building. 100% laser-cut wood with layered, peel and stick windows, door, and shingles, tabbed and notched wall and roof pieces, laser-cut wood loading dock with laser-scribed decking, and correct, Southern Pacific style, cast white metal chimneys. 6.25” Long w/o dock x 2” Wide w/o dock x 1.75” High…..8.75” Long w/dock x 2.5” Wide w/dock x 1.75” High. The Alton Elevator kit features 100% laser-cut components with our standard tab & slot wall and roof construction and Peel & Stick trim, windows and doors. Peel & Stick roofing material is also included with simulated metal roofing on the elevator roof and diamond shaped asbestos type shingles on the office addition’s roof. When fully assembled, the Elevator with addition (as pictured) measures 3.5 inches long x 3 inches wide x 6 inches high. The inspiration for this kit came from plans in the January 1982 issue of Railroad Model Craftsman, the “Hinkle Milling Co.”, in Thomasville, NC. The original structure was built in 1883, and since it was continually added to over the years, it was eventually a sprawling industrial site of considerable appeal. Unfortunately for history buffs, we learned shortly after the 2001 release of our HO scale version (Dabler Mill & Supply Company) that the entire site had been razed, bulldozed away into nothingness. Features Tab & Slot wall construction, positionable Peel & Stick assembly windows with laser-cut glazing, Peel & Stick doors and trim, Peel & Stick tar paper, rolled roofing and simulated asphalt brick paper, wood deck loading dock, white metal smokejacks, and full color signage. As pictured (small office building may be modeled attached to or separate from main structure), assembled kit measures 7″ Wide x 10″ Deep x 2.5″ High. Over 70 Two Story Combination Type 22 depots were built by the Southern Pacific Railroad between 1899 and 1910. They were more commonly found in California, but examples were also located in Texas, Arizona, Utah, Oregon, and Nevada. A prominent feature of the Type 22 depot is the two-story high rectangular shaped bay window. The structure, which exhibited horizontal wood siding, typically measured 25 feet wide. The second story, with the same width of 25 feet, was usually 32 feet in length or longer. The freight room was built long enough to accommodate the SP’s anticipated business at that location and ranged in size from 30 to 84 feet in length. Other variations between Type 22 depots also existed such as loading dock size, window and door arrangements, and roof design as well as mirrored floor plans. 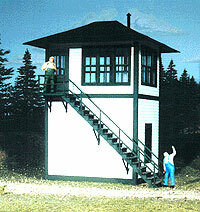 In fact, our latest N scale SP depot offering is considered a “left hand” version of this famous depot design due to the location of its bay window. Examples of “left handed” Type 22s could be found in California at La Verne, Palmdale, Grass Lake, and Chatsworth while numerous “right hand” versions existed as well. Our structure kit displays a 25 foot wide by 38 foot 6 inch long two-story portion with a 42 foot long freight room. As usual, the kit is 100% laser-cut and utilizes Peel & Stick and Tab & Slot construction. Features include: 3-Tab shingles, loading dock with wood deck, positionable window sashes, authentic gable trim, and accurately shaped brackets. Optional detail parts include bay ticket window and three different chimney styles so the modeler can best match the model to the prototype they are representing on their layout. The assembled structure measures 6.75” long x 2.75” wide x 2.5” high. The loading dock adds 2.75” to length and 0.75 “ to width. A traditional small church design that can be found throughout the United States. Totally precision laser-cut, the kit features Peel & Stick windows/doors and pre-colored, Peel & Stick tin style roofing paper. Measures 2 1/2″ long x 1 1/8″ wide x 2″ high. This Dry Goods shop is a false front building reminiscent of those built throughout the US in the late nineteenth and early twentieth centuries. It features a store front window, wood boardwalk, color sign, white metal chimney, Peel & Stick windows/doors, and rolled roofing. The finished structure measures 3″L x 1 3/8″W x1 3/4″H. Three typical company house kits included in each box. Footprints 1.5″ long x 1.5″ wide x 1″ high.